Welcome to River Overlook on the Tennessee River The bird`s eye view of River Overlook The large deck on the upper level of the dock. The view of the Tennessee River from the home. The view of the Tennessee River from the home. The master bedroom leads out to a sunroom. The sunroom off of the master bedroom. The view from the sunroom to the upper deck. The upper deck of the house with the river view. The view of the dock from the deck. The open living area on the main floor. The open living area on the main floor. The upper deck is off of the living area on the main floor. Full kitchen with bar. Full kitchen with bar. The master bathroom. The downstairs living area. Relax on the lower deck. Another view of the lower deck. Sit and enjoy the day There are two bunk bed rooms on the lower level. There are two bunk bedrooms on the lower level The front of the house. 24 miles to Rock City. Perched 125 feet above the Tennessee River. Dock with deck on the river. Get away from it all. 30 minutes from Chattanooga. Plan to unplug! There is NO INTERNET and NO TELEVISION. Decks and sunroom off of the master bedroom. This vacation rental and unique property is perched 125 feet above the Tennessee River in the famous Tennessee River Gorge. It has two decks (upper and lower) as well as a sun room facing the beautiful view of the river as well fabulous views of mountains in all directions rising up to 1200 feet. To the east, directly across the river, is Raccoon mountain and to the north you can see the famous rock climbing wall called the “T” wall (35.069038, -85.398932). The upper deck has a table and chairs for your morning coffee as well as a charcoal grill. The sunroom has carpeting and comfortable wicker seating with pads. The Lower deck has two swinging wicker love seats with pads, a hammock and ceiling fans. This vacation rental home is a 3 bedroom 2 1/2 bath fully furnished home. The master bedroom on the main level hosts two twin bed connected with a twin bed bridge, actually making it a king sized bed. The sunroom and the master bath are also attached to the master bedroom. 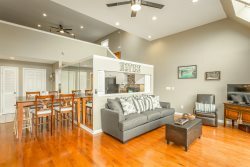 The main level also has the full kitchen and dining area, a half bath, and a comfortable seating area with sliding glass doors leading to the view and the upper deck. On the lower level of this house you will find the other two bedrooms which have a bunk bed in each room with a twin bed on the top bunk and a full bed on the bottom bunk. The lower level also has a full bath, a laundry room and a comfortable seating area along with with a gas fireplace and a large flat screen TV, but no cable. It also has sliding glass doors leading to the view and onto the lower deck. Maximum occupancy at all times is 6 people. There is NO internet and the TV's are for video, dvds only, no channels. This property is about 18 miles from downtown, but sometimes feels further because of the slow, narrow, winding river road. The view is fantastic however, and provides a wonderful way to slow down from hectic daily life! DOWN ON THE RIVER If you decide to go down to the river, it is a little over 200 steps (wooden, concrete and large field stones) to get there. Once you get there you will find a huge dock, complete with seating all the way around the upper level and a fire pit right next to the river. The hike back up can to house can be considered strenuous with over 200 steps and a 125 foot climb. Rooms Sleeps 6, Downstairs bedrooms each have a bunk bed with a full on the bottom and a twin on the top. The master suite on the main level has two twins, combined as a king. Thorough. Answered every question I had and gave a few tips on what to do around town. Fantastic. Thank you for an incredible place to stay. Amazing Girls Weekend Getaway 7 girls vacationed here for a short getaway. We loved the layout and the dock! It is a hike down and back, but totally worth it. The drive from the bottom of the mountain to the rental is a solid 30 mins so plan accordingly. The owners were amazing as well! Wonderful Place for a Reader's Retreat Plenty of space and a lovely view. The home was clean and comfortable. We had a great extended weekend here! We had a very good weekend here and really enjoyed our stay at the River Outlook! It was just the two of us with our dog and it was the perfect relaxing weekend getaway,.We greatly enjoyed strolling around the downtown streets and riverfront of Chattanooga during one of our days here, but the other days we just enjoyed the property as well as exploring areas further away from downtown. There's a great winery about 30 minutes west of here that we'd recommend, they do wood fired pizza too! We spent time down at the dock and on the water (we brought our kayaks and fishing gear) everyday as well. As other reviewers have mentioned, the walk back up helped us burn off the calories from all the great meals we made in the well equipped kitchen. This place had more than enough space for us and our dog, in fact we could have brought 4 other people and everyone would have had their own bed! Great property, well equipped, far enough away from city life to completely detach, but close enough to explore it if that's what you're feeling. Highly recommended! We had a great time here. The majority of the time was spent on the dock fishing with the kids (3 yr old and 6 yr old) and enjoying the scenery. We didn't believe the walk down to the dock would be that bad and boy were we wrong haha. It isn't for the faint of heart. We are in shape but the walk back up to the house was very difficult. That didn't stop us from making the round trip a couple times a day though haha. I am sure we will be revisiting River Overlook when we return to Chattanooga. Thank you for allowing us to stay in this beautiful house. We had a very lovely time for a quick family getaway. The view is unbeatable and the fishing off the dock was wonderful! The fire pit by the water was a very nice evening treat. We loved the sunporch. The walk to and from the water was steep but doable (can check that off your gym list!). The drive on the last road to the house IS very curvy and bumpy. The last 14 miles took every bit of 40 minutes and that was not being too timid. It was worth it! We stayed in all weekend and relaxed and went to Chattanooga as we left on Sunday for a nice lunch at Puckett's Grocery. Totally recommend downtown Chattanooga for a relaxing stroll along the river. We had a great time at the River Overlook and the SkyBox Chalet people were great. The road to the house is winding with a few hills :) but at the same time it is a beautiful drive and worth it. The house was very clean and accommodating. The decks were great to sit outside above the Tennessee River.